Successfully Added Chuwi Vi7 Android Phablet - 3G SIM Slot, 7 Inch IPS Screen, Android 5.1, GPS, Quad Core CPU, 2500mAh Battery to your Shopping Cart. Watch movies, play games, get upgrades at the Play Store – you know how it goes. But unlike other pricier devices, the Chuwi Vi7 Android tablet gives you all of the tablet functionality in a budget-friendly package. Dubbed “the ultra budget tablet with phone functionality”, it will offer you everything you need without reaching deep into your pocket. The Chuwi Vi7 comes with a 7 inch IPS 1024x600 screen that will let you comfortably watch any media and indulge in gameplay. Thanks to Android 5.1 operating system, you will have a familiar intuitive interface at your service, letting you navigate the tablet with ease. When you feel like adding more functionality, simply pay a visit to the Play Store and pick up a few of the latest apps, tools or games. The tablet comes with 3G connectivity and full phone functionality. All you need to do is insert a SIM card, and the Chuwi Vi7 will help you stay connected throughout the day. Make and receive calls, browse the web, share photos, get social media updates and more – all on a large 7 inch display. With Wi-Fi and Bluetooth 4.0, you will also be able to hook it up with ease to other devices: speakers, handsfree sets and more. With the 2500mAh battery, the tablet comes with 2 hours of non-stop talk time and lots more on standby and when used frugally. The Chuwi Vi7 is equipped with front and back cameras and supports micro SD cards of up to 64GB. 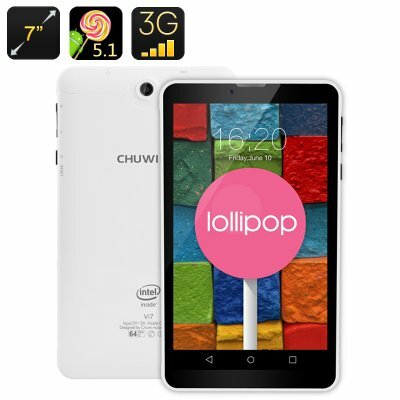 The Chuwi Vi7 Android Tablet comes with a 12 months warranty. Brought to you by the leader in electronic devices as well as wholesale Android tablets..